Today we’ll run through how you can customize the relatively new WooTickets feature for Events Calendar by Modern Tribe. That’s fine and all, they’re creating a basic form that will hopefully fit into any theme somewhat decently. But we want something a bit more fabulous, right? Let’s do it. Now we can customize that file, similar to any theme template file, to our heart’s content. Change the title of the checkout form. Set the quantity of tickets to be purchased to 1 by default (instead of 0). Get rid of the table layout for something a little easier to work with in CSS. This is the easiest. I want to change it because I prefer a call to action rather than the label of “Tickets”. Shazaam, now we’re coding with fury! Nobody wants to buy 0 tickets, why give them one more step to complete when trying to make a purchase. Luckily, this is another easy fix. And change the input_value to 1 (or higher if it fits your situation). This removes the requirement that they click the up arrow or type in a 1 to begin with, and they can still change the value later if they’d like. 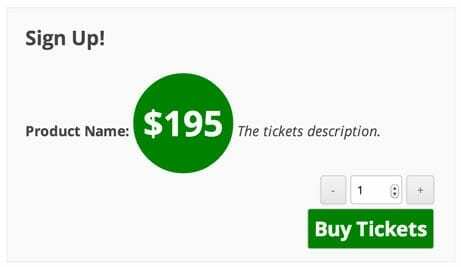 I do understand that this can be considered tabular data, and certainly if you were purchasing multiple tickets which needed to be displayed before you click the Add to Cart button this would be useful. But that doesn’t even seem to be a possibility with the current way the plugin works. So let’s ditch tables. <form action="<?php echo esc_url( add_query_arg( 'wootickets_process', 1, $woocommerce->cart->get_cart_url() ) ); ?>"
Which I think looks a bit slicker and more obvious than what is output by default. You know, for when it’s all about the sales! Even if you don’t love my final layout, this should give you a solid basis to make whatever changes you’d like for your own site! Here’s the real question though: how do you customize the WooTickets Ticket email that gets sent out? It’s the only one that doesn’t seem to have an editable template somewhere. Great question. As of release 2.0 I see the changelog listing “The PDF tickets are gone and replaced by a straightforward email template that should be easier to customize.” as one of the update, but that’s certainly not the case from what I can see. I’m going to check with Tri.be and see what they say. Actually, nix that. Looking through the plugin itself I see where the email is being created, in classes/class-ticket-email.php. Look for the functions get_subject and get_content_html(). From there you could simply edit the code with the knowledge that any updates will require you to make your changes again, or you could go ahead and try and hook into the get_content_html() to alter its output, but unfortunately I don’t have time right at the moment to write up such a tutorial, though I’m sure it’d be mighty useful. Good effort – you’re missing a closing div tag in there which causes the layout to look odd when there are multiple tickets on offer. Also, copying your code is fine but pasting it does not seem to preserve the format. Oh – I just found the code for displaying the form on the list view on pastebin…. I haven’t had to work with the Tickets plugin recently and so probably won’t be writing any further about it any time soon, but if anything else comes up I’ll definitely share any new knowledge I come up with. How I can show the ticket stok in the table? Not sure, Pablo, as I haven’t had to do that to date. I tried this but its not working, I think in part due to updates to Woocommerce. Only works when a logged in user, even if Guest Account option is on. Have you revisited this lately? I haven’t, Adam, this post is a few years old now and I haven’t needed to use or work with Wootickets in some time. Can i show stock i.e show how many tickets are available to purchase? I would like to skip the cart and go straight to the checkout page. Do you have any idea how to do this for Wootickets, as the normal fix does not work. If you go to Woocommerce > Settings > Products > Display and check the box next to Redirect to the cart page after successful addition, that doesn’t do what you’re looking for? Any other suggestions on a way to get the remaining ticket count to show up (anywhere on the page is fine with me!) Thanks. Nothing off of the top of my head. Maybe you need to do a global call to get $ticket object. Perhaps global $ticket would work? but as i try till now i wasn’t able to do it..
do you guys have any solution for this. So that it won’t display. Any idea how to stop this from happening? Sorry about the duplicate message. I updated woocommerce template files and now it shows. Thanks for this tutorial !! how can i display ticket at the top of the event page ? That will be affected by exactly where the call to tickets.php is in your theme file, and also possibly/likely by your CSS. Glad this post helped you!